The Hi-Desert Pirate Festival, in Hesperia, California. We had a blast on our first ever transcontinental charity tour. In August and September of 2014 we traveled from San Francisco California all the way to New England giving rides to patients, clients, volunteers and staff at a number of charitable organizations. We stopped at children's hospitals, charities for wounded veterans, charities for the blind, those with autism and those with Down's syndrome and gave rides as our gift to these very special people. The trip was an amazing and heartwarming experience that we want to make an annual event. We are looking for sponsors to help cover our travel expenses. Contact us if you know of any sponsors or simply want to be a part of this side of our work. Any donations over and above our travel expenses will be donated to the Shriner's Hospitals. We hope to give the Shriners a very generous donation. Any direct donations are being deposited into a dedicated savings account. Follow the travel blog here! Swing by our Rockinghorse Mercantile and see what fun items we have for sale. All the proceeds from your purchases will go to fund the deficit from our charity tour. You can also get one of our exclusive Rock On charity tour shirts. The proceeds will go to fund the shortfall from our 2014 trip. We will have a limited number of these shirts available for purchase at events. Contact us with your size and style preference so we know which one makes your heart sing. (available in tank top or beefy tee) and we will dispatch minions to deliver your shirt right away. Get yours now and get a free ride when you wear it at any event we are rocking. This young man is one of our heroes, having overcome a serious illness and paralysis. Nothing slows him down and his joy during his rockinghose ride was positively infectious. Meeting people like him enriches our lives immeasurably. Wheelchairs, walkers and crutches are no impediment to us--we WILL help you take the ride of a lifetime. Want to make your event uniquely memorable? Yes, we do fundraisers. If you have an event you would like our giant rockinghorses at, please do contact us for fundraiser details. Weddings definitely rock when you have the Rockinghorse couple at your reception. We just had THE best time we've ever had at any event with Dan and Leianna at their wedding reception. They are a truly spectacular couple and we were delighted and honoured to bring Vlad to share in their special celebration of the magic they weave together. Congratulations Dan and Leianna! May your happiness increase exponentially every year you share together. Like our video clips? See much more on our YouTube page . From shirts to beach bags, hats to cozy footed pajamas, mugs to window stickers, we've got you covered. 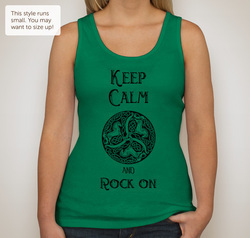 Rock on over to our Sweet Swag Shop and get your logo gear hot off the presses. Even better, show up at any of our events wearing our logo attire and you get a FREE rockinghorse ride! 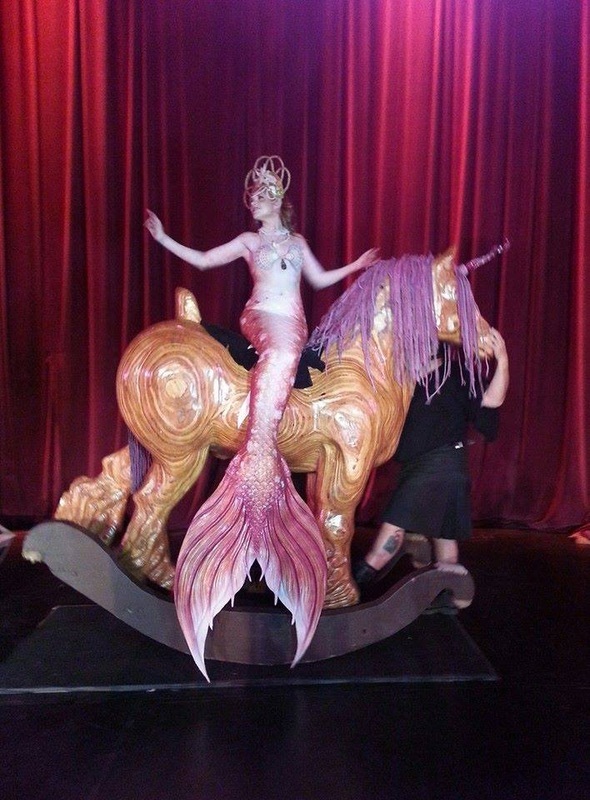 Ginger, the Koi Queen, rides Vlad at Myth Masque in Los Angeles. Yes, our life truly rocks. 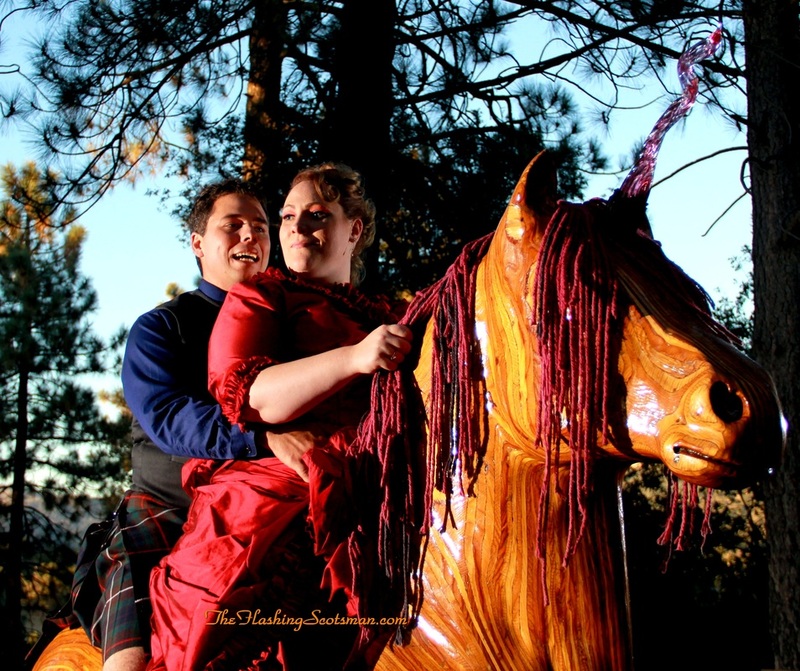 Be your wedding traditional and formal or themed such as a Renaissance or Faery wedding, imagine the reactions of your guests when you surprise them with an eight foot tall rocking unicorn or a sweet faced rocking mare at your reception. We not only can provide you with Vlad or Freya, we also provide professional photographic services and will give your guests unlimited rockinghorse rides. Imagine the romance of a newlywed ride to kick off your wedding reception! 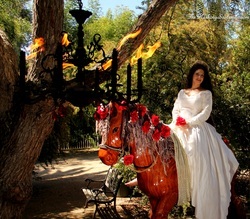 For a modest additional fee, you can even have the horse decorated in flowers in your wedding colors. You heard it here first folks! Yes, you CAN book your very own photo session with Vlad or Freya. Edgy, glamourous, romantic, family portraits, we can do it all for you. When we aren't rocking, Lester is the Flashing Scotsman, taking professional portraits that will blow you away. Contact him here or on our Facebook page and we'll get your session scheduled at very reasonable rates. If you want photos without the horses that is just as easily arranged--all you have to do is tell him what you have in mind. We hope to see you all again soon--we LOVE playing with you. Keep watching for an announcement of our next visit with the horses, because you never know where we'll go next! We even make random surprise public appearances--look for announcements of the locations on Twitter. 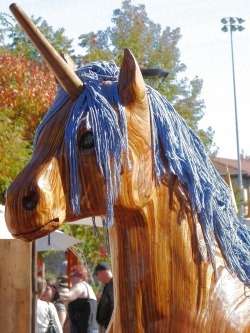 Meet Vlad, the world's largest wooden rocking horse! Vlad, along with his partner in crime Freya, are the largest wooden rocking horses in the world. Vlad stands a healthy seven feet eight inches tall on his rockers and, at 1200 pounds, can easily carry multiple lucky riders on his broad and comfortable back on a ride to wonder and delight. Freya is somewhat more petite, standing six feet six inches on her rockers, but she can carry just as many passengers as the proud Vlad. They've given rides to all ages, from two weeks all the way up to jolly young folk in their 90s, and caused countless squeals of utter delight. Vlad is proud, handsome, and a bit imperious, while Freya sparkles with her own gentle personality and a broad mischievous streak. 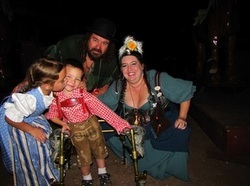 Vlad and Freya were designed and created by Lester, the Rockinghorse guy, starting in 2000, and have since traveled the country spreading joy and laughter where'er they go. Our happily family also includes Katlinel, the Rockinghorsegal, and our beloved mascat Vermin who travels with us to many a faire land. We are available for faires, weddings, birthday parties, promotions and all sorts of special events, and we travel frequently, so keep an eye peeled on our upcoming events page for times when we will be in your area. If you would like us to come to your faire shire for a special event, please do send your inquiries to us at bookings@rockinghorseguy.com .